This post contains mild spoilers for Escape Room. January is, frankly, a dismal time at the movies if you've already seen the latest Star War or superhero joint or awards-baity prestige film and are looking for something to paste onto your eyeballs before the next Avengers movie comes out. Most years, January is where the cast-offs from the previous months are shunted while everyone else is busy doing their year-end catch-up marathons before the Oscars. But sometimes, very occasionally, a film comes along that is not only entertaining, but actually pretty good, and kicks off the new year just right. This year, that movie is Escape Room. Escape rooms, the relatively new group party fad in which you and your friends are locked inside a room and must use clues hidden amongst trinkets and drib-drabs to find the key or the code that opens the door, have become wildly popular over the last few years, perfect for birthday parties or awkward team-building office outings. It was only a matter of time before escape rooms got the horror movie treatment, and, honestly, I can't think of more perfect fodder for a nice, tight thriller. At the start of Escape Room, six people are invited, via mysterious puzzle boxes delivered to them in the mail, to test out an extra-special, immersive experimental escape room experience. If they find their way out, they win $10,000. Seems like a pretty chill way to spend a weekend, and shortly after they all arrive at the austere concrete building that houses the game, it begins. But, unlike real escape rooms, which may model themselves after zombie apocalypses and creepy hospitals, the stakes are real. If our heroes fail to escape the rooms of Escape Room, they die. And what rooms they are! There is a broader and more intricate plot going on in Escape Room, but, truthfully, it's the rooms themselves that really stand out. First, the group is treated to a waiting area that turns into an easy bake oven as soon as they twist what they think is the dial that opens the door, and they have to find a way out before they're incinerated. Then they have to find their way out of a rapidly cooling snowy forest with a freezing river that threatens to swallow any one of them whole. 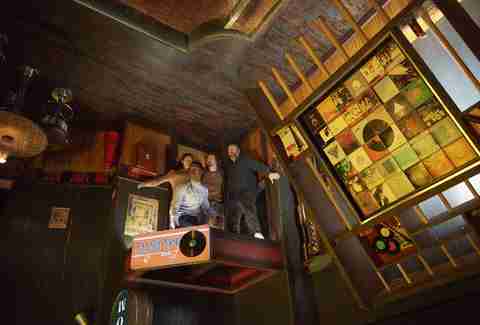 Afterward, they're treated to an upside-down saloon with a floor (ceiling?) that occasionally just decides to crumble below their feet, a dingy hospital bunker, and a Victorian drawing room full of antiques that slowly crushes anyone inside. It's more Hunger Games than Saw (but it's MOST like 1998's Cube), but even with the threat of a violent, horrible death looming at all times, the movie is relatively low on gore. In fact, the players rarely have to harm themselves (even if they think they do) in order to unlock each room. Instead, the puzzles are psychological, operating off of each character's specific paranoia or trauma caused by the past. Gradually, as the game moves forward, it becomes apparent to each of the participants that there's something more going on. The rooms seem to know, somehow, about the one single, horrible, world-shattering thing that happened to them, and they're repeatedly taunted with it. Amongst the shrieking and freaking out and lines like, "We have to find a key!" "Numbers, look for numbers!" "Why are they doing this to us!?" are a few very solid, at times genuinely affecting, performances from the main cast, especially Tyler Labine as Mike, a classic fishing dad in plaid shirt and jeans who can't stop making self-effacing jokes, Daredevil's Deborah Ann Woll as Amanda, an army veteran who suffers from bouts of PTSD, and Lost in Space's Taylor Russell as Zoey, whose timid yet mathematically brilliant college student ends up being really, really good at solving escape rooms. It's FUN to watch people solve puzzles that take up whole rooms, even if those people are fighting for their lives while they're doing it. It's exhilarating to see Zoey put the pieces together in her head while the clock is running out, or to watch Amanda swing from an upside-down pool table while the floor tumbles down beneath her. It's so much fun that the payoff is ultimately a convoluted disappointment, but I can hardly complain considering how many times I gasped or cringed or whispered "yesss" throughout the rest of it. 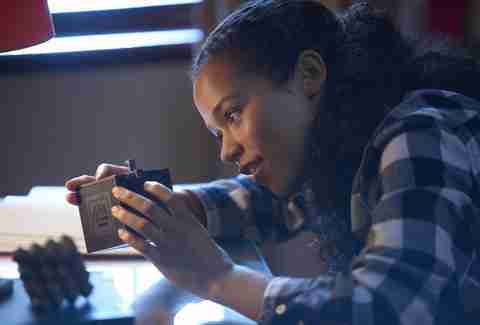 Escape Room is much better than an early January horror movie has any right to be, finding plenty of thrills in its undeniably perfect premise. 2019 is already off to a great start. Emma Stefansky is a staff entertainment writer at Thrillist. She has never done an escape room because she fears the humiliation of failure. Follow her on Twitter @stefabsky.